Pumpkins are most often associated with Halloween and autumn. That being said, the pumpkin has many uses, and may be especially useful for fighting disease. Pumpkin seed oil, in particular, is said to be very beneficial for overall health. Studies suggest pumpkin seed oil is notably effective in treatment against inflammation, diabetes, urinary disorders, prostate diseases, anxiety, and cancer. It may also be useful for fighting hair loss and improving heart health. This article explains the many reported health benefits of the oil and how to use it properly. We’ll also give you some recipes to get started. Pumpkin seed oil is obtained from two pumpkin types of the Cucurbita plant—Cucurbita maxima and Cucurbita pepo. Its extraction is quite simple. Basically, the seeds are roasted and pressed. A longer roasting period and reduced temperature will help achieve antioxidant-rich pumpkin seed oil. The original home of the pumpkin is North America, and experts believe Native Americans used pumpkins for their medicinal and dietary benefits as far back as 1300 A.D. Pumpkin seeds would become part of the European diet after being spread to Eastern Europe and the Mediterranean. Today, the U.S. is the largest producer of pumpkins, followed by India, Mexico, and China. What is important about pumpkin seed oil nutrition? The nutrient-rich oil contains the essential amino acid tryptophan. Research shows that tryptophan has a positive effect on sleep and mood. One cup of pumpkin seeds contains 11.9 grams of protein, 34.3 grams of carbs, 12.4 grams of fat, and 11.8 grams fiber. Pumpkin seeds are an excellent source of zinc, which is maintained through the production of pumpkin seed oil. Pumpkin seeds are also a valuable source of magnesium, potassium, manganese, and copper. The following is a comprehensive pumpkin seed nutrition chart with information for about a cup, or 64 grams, of pumpkin seeds. 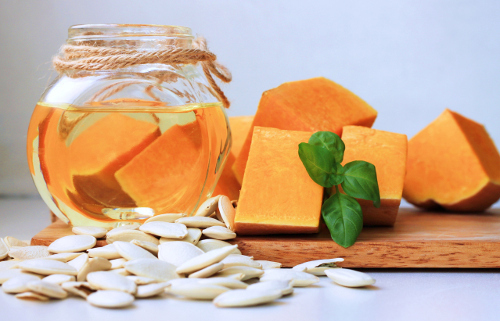 What are the health benefits of pumpkin seed oil? Well, since it is healthy unsaturated fat source, it could potentially reduce inflammation in people suffering from atherosclerosis and non-alcoholic fatty liver disease. Pumpkin seed oil also exhibits cardio-protective and anti-hypertensive effects, which may protect against heart disease and heart attacks. Studies also indicate the oil can decrease high blood pressure in postmenopausal women. Pumpkin seed oil is also often part of a treatment protocol for parasites. The following is a detailed synopsis of six other purported benefits. Pumpkin seed oil supports the health of cancer patients, and may decrease the cancer risk in general, according to research. It could reduce the effects of specific carcinogens, which suggests the potential to naturally treat various types of cancer. A study published in the journal Nutrition and Cancer in 2013 found that lignans in pumpkin seeds can possibly prevent and treat breast cancer. Another study published in the International Journal of Oncology in 2011 found that a dietary supplement with pumpkin seed can help inhibit or decrease the growth of prostate cancer cells. The antioxidant properties in the oil may also protect against radiation and intestinal damage from the cancer treatment methotrexate. The Cucurbita maxima compound in pumpkin seed oil may help improve memory. In a study published in the Canadian Journal of Physiology and Pharmacology in 2007, the tryptophan content in the oil was found to be an effective treatment for social anxiety disorder. Tryptophan is also linked with a more peaceful sleep. Pumpkin seed oil is reported to benefit prostate health in general, and help protect against prostate cancer. A study published in the journal Urologia Internationalis in 2011 found that pumpkin seed oil can decrease the size of an enlarged prostate, especially in age-related prostate enlargement known as benign prostatic hyperplasia. In other studies, pumpkin seed oil and saw palmetto oil combined to safely treat benign prostatic hyperplasia. Both type 1 and type 2 diabetes can be managed and treated with a good diet, which may include pumpkin seed oil. A study published in the Journal of the Formosan Medical Association in 2013 found that pumpkin seed oil has antihyperglycemic abilities, and may therefore be useful as a natural diabetes treatment. Pumpkin seed oil can be part of maintaining a healthy excretory system. For instance, a study published in the Journal of Traditional and Complementary Medicine in 2014 suggested that the extracts from pumpkin seed oil effectively treat urinary disorders, such as an overactive bladder. For the study, 10 grams of pumpkin seed oil extract was given daily for a 12-week period. Androgenetic alopecia is a condition also called male-pattern baldness. A double-blind, placebo-controlled study published in the journal Evidence-Based Complementary and Alternative Medicine in 2014 found that men taking pumpkin seed oil for 24 weeks showed a hair count increase by an average of 40%. Pumpkin seed oil is a hair loss remedy due to its high zinc content, which will balance hormones and subsequently benefit hair growth. Want to know how to use pumpkin seed oil? First take note that pumpkin seeds should not be heated because this produces a bitter taste, and destroys many of the health benefits of pumpkin seed oil. The most common use of the oil is in liquid or capsule form. It is also common in salad dressings, either on its own or in combination with other healthy oils like extra virgin olive oil or avocado oil. Storage is important when it comes to pumpkin seed oil, as light and warmth can oxidize the polyunsaturated fats found in the oil, which can cause it to become rancid. To prevent this result, it should be stored in a dark, cool place. The fresh, nutty taste of pumpkin seed oil will begin to dissipate after being opened; however, it remains good for 12 months, and sometimes longer. Using a new ingredient can sometimes be a challenge. To help you out, the following are three pumpkin seed oil recipes that can be implemented into your diet. In a bowl, combine salt, icing sugar, mustard, walnut oil, and pumpkin seed oil with pepper, more salt, lemon juice, and apple cider vinegar. The dressing can be used over any type of salad. Scoop the flesh of the avocado from the peel and into a mixing bowl. Mash the avocado and add the cilantro, onion, salt, lime, pepper, and chili flakes. Cover guacamole with plastic wrap to prevent oxidation. Before serving, add tomatoes and pumpkin seed oil and combine well. Serve with corn tortilla chips or crackers. Wash the potatoes well and cook them al dente in salted water. Drain and remove from heat. Peel potatoes, slice into medium-sized slices, and return to the pot. Add the vegetable stock, apple cider vinegar, salt, and pepper. Mix the potatoes well, and let rest. Add the pumpkin seed oil and garnish with romaine lettuce or dandelion greens. Pumpkin seed oil may benefit your health in a number of ways, including treating diabetes, urinary disorders, high blood pressure, hair loss, anxiety, prostate problems, and cancer. It is also important to note that there are few documented pumpkin seed oil side effects. That being said, due to the hypotensive effects of pumpkin seed oil, it is best to consult with your doctor before using the oil with hypertension medications. “Styrian Gold Pumpkin Seed Oil Recipes,” Styrian Gold; http://www.styriangold.ca/recipes/, last accessed April 12, 2017. “Health and Nutrition of Styrian Pumpkin Seeds and Oil,” Styrian Gold; http://www.styriangold.ca/health-nutrition/, last accessed April 12, 2017. Brusie, C., “The Health Benefits of Pumpkin Seed Oil,” Healthline, June 10, 2016; http://www.healthline.com/health/pumpkin-seed-oil, last accessed April 12, 2017. “Seeds, pumpkin and squash seeds, whole, roasted, without salt Nutrition Facts & Calories,” SELFNutritionData; http://nutritiondata.self.com/facts/nut-and-seed-products/3141/2, last accessed April 12, 2017. Hudson, C., “Protein-source tryptophan as an efficacious treatment for social anxiety disorder: a pilot study,” Canadian Journal of Physiology and Pharmacology, 2007, 85(9): 928-932, doi. 10.1139/Y07-082. Cho, Y.H., et al., “Effect of Pumpkin Seed Oil on Hair Growth in Men with Androgenetic Alopecia: A Randomized, Double-Blind, Placebo-Controlled Trial,” Evidence-Based Complementary and Alternative Medicine, 2014, 549721, doi: 10.1155/2014/549721. Bharti, S.K., et al., “Tocopherol from seeds of Cucurbita pepo against diabetes: validation by in vivo experiments supported by computational docking,” The Journal of the Formosan Medical Association, November 2013; 112(11): 676-690. https://www.ncbi.nlm.nih.gov/pubmed/24344360. Nishimura, M., et al., “Pumpkin Seed Oil Extracted From Cucurbita maxima improves Urinary Disorder in Human Overactive Bladder,” Journal of Traditional and Complementary Medicine, January 2014; 4(1): 72-74, doi: 10.4103/2225-4110.124355. Ejike,C.E., et al., “Inhibition of the experimental induction of benign prostatic hyperplasia: a possible role for fluted pumpkin (Telfairia occidentalis Hook f.) seeds,” Urologia Internationalis, 2011; 87(2): 218-224, doi: 10.1159/000327018. Hong, H., “Effects of pumpksin seed oil and saw palmetto oil in Korean men with symptomatic benign prostatic hyperplasia,” Nutrition Research and Practice, Winter 2009; 3(4): 323-327, doi: 10.4162/nrp.2009.3.4.323. Richter, D., et al., “Effects of phytoestrogen extracts isolated from pumpkin seeds on estradiol production and ER/PR expression in breast cancer trophoblast tumor cells,” Nutrition and Cancer, 2013; 65(5): 739-745, doi: 10.1080/01635581.2013.797000. Jiang, J., et al., “Suppression of growth and invasive behavior of human prostate cancer cells by ProstaCaid: mechanism of activity,” International Journal of Oncology, June 2011; 38(6): 1675-1682, doi: 10.3892/ijo.2011.996.